SENTO SE, Brazil, Jan 29 2017 (IPS) - “Now we have internet and TV. Before, we didn’t even have electricity, but it was better,” said Lourival de Barros, one of the people displaced by the hydropower plants which have mushroomed aorund Brazil, mainly since the 1970s. Barros was evicted from his home in Sento Sé towards the end of 1976. The town of 7,000 people was submerged under the waters of the Sobradinho reservoir just over a year later. Three other towns, Casa Nova, Pilão Arcado and Remanso, also disappeared under water, along with dozens of riverside villages, in the state of Bahía in Northeastern Brazil. In total, 72,000 people were displaced, according to social organisations, or 59,265 according to the company responsible for the project, the São Francisco Hydroelectric Company (CHESF). The sacrifice was made for the sake of the country’s energy requirements and for the development of what was described by government leaders of the time, during the 1964-1985 military dictatorship, as an “irrelevant” region, marked by widespread illiteracy, a “subsistence economy,” and “primitive,” isolated people afraid of change. 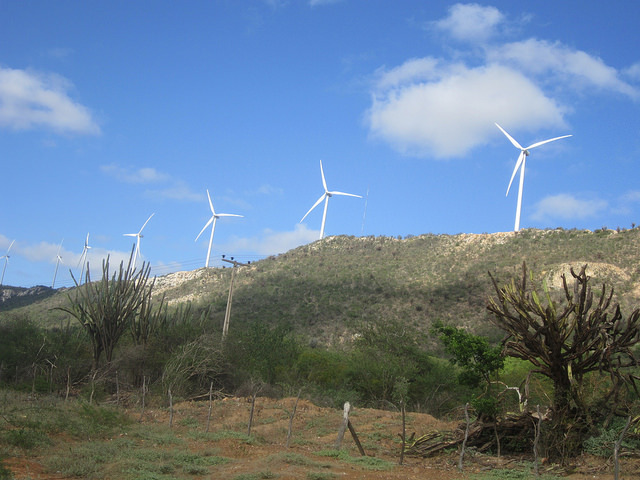 To relocate the population of Santo Sé, a new city with the same name was built, with better houses, including indoor bathrooms and services such as electricity and sewage. But “we lost much more”, said Barros, a 70-year-old retired fisherman and small farmer with eight children, nine grandchildren and three great-grandchildren. “We had many fish in the river. In the reservoir at first we could fish 100 kg a day, but the fish declinednin the last 10 to 15 years, and now it’s hard to catch even 10 kg, just enough to feed the family,” he told IPS. “There were 2,000 fishers and it was the livelihood of all of us. Today, there are at best 50 who are able to live off fishing,” even though 9,000 are registered in the trade association, many of them just to receive the unemployment payments during the spawning period when fishing is banned, he said. “They need it,” he added. Barros laments that the fish native to the area have disappeared, while other Amazon species were introduced in the artificial lake, including one, the pavón (Cichla ocellaris), which eats all the others. He also complains that his family used to have five plots of land where they grew crops and he owned a mill to make manioc flour, for which they did not receive any compensation. “We lost everything,” he said. Many flooded properties or assets have still not been compensated, said Adzamara Amaral, author of the book “Memories of a submerged city,” written in 2012 as the thesis for her journalism degree at the University of the State of Bahía. Her own family is still fighting in court for compensation for 15,000 hectares registered as property of her grandfather, which was in her family for three centuries and included three houses and fruit orchards. The new town built for the relocated population was deprived of its “riverine” spirit, as in the case of other “rebuilt” towns. Also lost, besides the fish, was the traditional riverbank farming during the dry season, when water levels were down and crops were planted next to the river on the nutrient-rich soil replenished each year by the seasonal floods. Large harvests of corn and beans were planted between April and October. “That is why the São Francisco river is known as the ‘Brazilian Nile,’ Amaral told IPS. 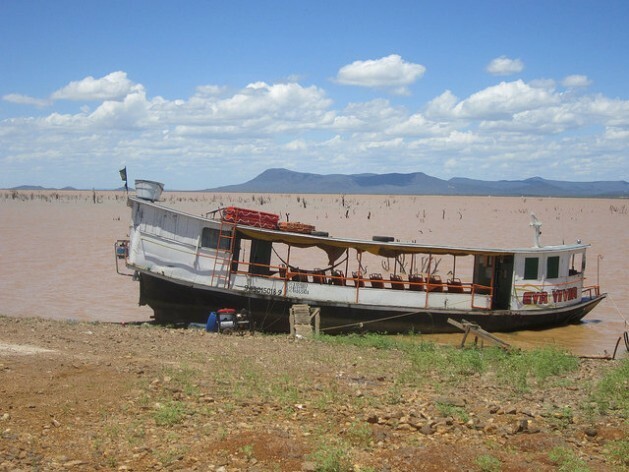 With the dam, the water flooded rocky areas or parts of the Caatinga – the semi-arid ecosystem exclusive to the Northeast – and modified the annual changes in the low and high water levels in the river, putting an end to dry season farming. Relocation to the new Sento Sé, population 41,000 today, accentuated the isolation of the local inhabitants, among other reasons because the distance doubled with respect to Juazeiro, a city of 220,000 people, which is the economic and educational hub of the northern part of Bahía. Now the town is 196 km away, 50 of which are along a dirt road filled with potholes that makes transportation difficult. That is the reason the irrigation agriculture company Fruitmag which employed 1,800 workers, pulled out of Sento Sé, arguing that the jolting of the trucks damaged the grapes. “Paving the road is key to the development of the municipality, as is offering technical and university courses, which would prevent the exodus of young people, which has been reducing the local population in recent years,” said Amaral. The new location of the town on the banks of the lake was meant to keep it near the shore even during the dry season, she said. But many people believe that the then mayor decided on the location so it would be near his farm. Now, the shore of the Sobradinho reservoir has retreated some 600 metres from Santo Sé, after five years of drought. “There are places where the water ebbs up to 10 km, like in Quixaba, a nearby town,” said João Reis, a 65-year-old metal worker from São Paulo, who worked for years in CHESF. 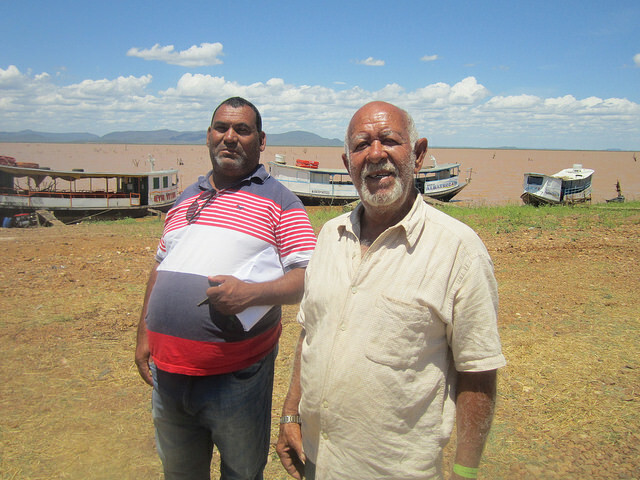 To overcome its isolation, his colleague Djalma Vitorino, a boat specialist, proposes setting up a ferry service between Sento Sé and Remanso, another relocated town, on the other side of the reservoir. About 25 km or “an hour and a half of navigation” separate the two towns. 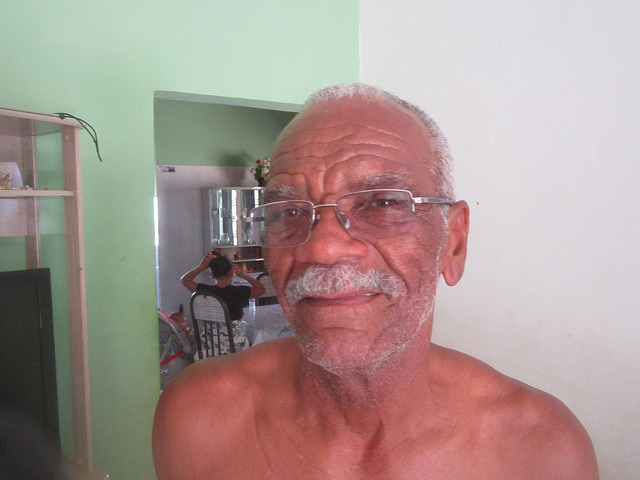 “They have a good hospital there where we can take our sick people,” as an alternative to Juazeiro, which is more than three hours away by road, Vitorino told IPS. Built between 1973 and 1979 on the São Francisco river, the Sobradinho hydropower plant has the capacity to generate 1,050 MW, thanks to its reservoir of 34,000 cubic metres that covers 4,214 square km, the biggest in surface area and the third in water volume in Brazil. In addition to the generation of electric power, accumulating so much water also gives it the functions of regulating the flow, optimising the operation of seven hydropower plants built downstream, and supplying water for the irrigation of crops in the surrounding area. Its social impacts stood out because a highly populated area was flooded, in the 1970s, when the country was governed by an authoritarian military regime and environmental legislation was just starting to be developed. Moreover, social movements were weak or nonexistent. To flood that much land, Sobradinho required the expropriation of 26,000 properties. CHESF shelled out very low sums in the few cases of compensation it paid, mostly because “the local people did not have official title deeds or did not know how much their property was worth,” said 47-year-old Gildalio da Gama, who until December was secretary of environment in Sento Sé. His grandfather was not compensated for his land because CHESF did not recognise the submitted documentation, he said. New hydropower plants, such as Itaparica, inaugurated in 1988, downstream on the São Francisco river, meet the regulations, because of the pressure of environmentalists and social organisations. But forced displacement continues, generating noisier conflicts than in the past. Protests have grown even more against hydropower plants in the Amazon rainforest, particularly the one in Belo Monte, a huge power plant with a capacity of 11,233 MW, inaugurated on May 2016.